Written by Shayla Price on February 8, 2018 . Events are actions performed by users inside or outside your application that occur at a specific time. So the scope involves any user action you can track in the customer lifecycle. This event data is recorded to show users’ behaviors. Depending on your customer base, your application may generate millions of events each day. Your engineer can attach any related information to an event. These attributes can be used in your triggers to control who should receive event triggered campaigns. You can set any number of data keys and values. Here’s what it looks like behind the scenes: So, what would you record as event data? Let’s say your company is a consumer app where users can play, create, and share music. You can record events when a user makes a new tune, downloads a sample from your sound library, or exports a file to SoundCloud. With this event data, you can now send event triggered campaigns based on the user’s behavior. For example, if a user shares new music from your app to SoundCloud, you can send an email congratulating the user on publishing new tunes with a step-by-step guide on how to promote their work online. Think of event data as taking an account of your users’ actions. And with those known behaviors, you can send relevant messaging, like email, SMS, or push notifications. 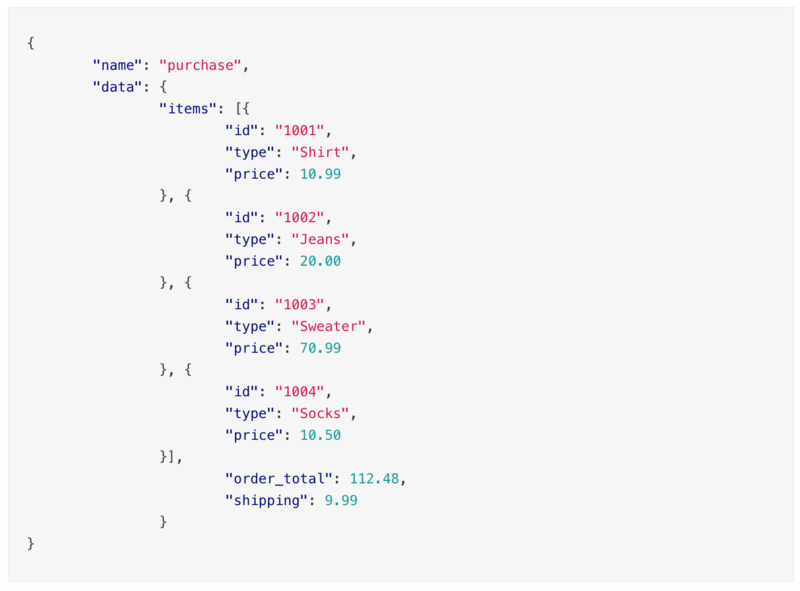 How Do I Send Customer.io Event Data? Here is where the fun begins. With your strategy and event data in hand, you now can set up campaigns based on your users’ behaviors. With event triggered campaigns, every time users perform a specific event you can automatically send them a message. You have the flexibility to send communications that fit the user’s actions. In the example below, users will only enter a campaign if they perform the event labeled marketing_activity. It’s vital that you create a consistent labeling system that works for your team. Each event may consist of several event attributes. You can use those specific attributes to filter an event. It helps your team narrow down your campaign’s audience. Below you’ll notice that users will only receive the campaign if they perform the marketing_activity event AND satisfy the three event attributes. The Liquid templating language makes it simple to add dynamic content to your messages. You can add data specific to the user automatically. In our platform, event data can be referenced in liquid templating. You access that data in your email text like this: We used an event triggered campaign in our own Customer.io account to send our 2017 Year in Review email. Each message contained a mix of user attributes and event data unique to the recipient. In this case, the event data included all the user’s annual campaign and delivery metrics (e.g. active/created campaigns, sent/opened emails). This data was pulled directly from our back-end storage with an ad-hoc script written by Joe Purdy, our amazing site reliability engineer. With that validated data, we triggered events for each user profile to queue up drafts in the campaign. Here’s a peak of what the 2017 Year in Review event data looked like: And here’s the actual email… Event data lets you adapt to your customers’ preferences and needs. Plus, this level of personalization sets you apart from your competitors. What you put into data is what you get out of it. With the endless possibilities of user behavior, it’s easy to get excited and want to collect every piece of data on your users. However, that practice is more harmful than you think. For starters, too much data hinders your strategy. A data dump makes it difficult for your team to analyze events. You’ll waste precious time sifting through unwanted data in search for what you need. That process will only leave you frustrated and push back your implementation plans. Moreover, there’s the security risk. Your company is responsible for all the information you gather about your consumers. With more user attributes comes more responsibility to safeguard their data. It’s better not to expose your customers to any unnecessary risks. Make sure your team is aware of data protection laws, like the GDPR. Below is an example of concise event data. It includes attributes about a specific purchase. From this code block, you can see the items purchased, the type of each item, and the price of the items. There’s also an order total and shipping cost. There’s no extraneous information. In the long run, collecting data just to have it isn’t beneficial for your company. Collaborate with your product and engineering teams to discover which data matters most. Data is powerful. So take the time to level up your technical know-how. With event data, your competitive advantage is sending personalized messages to your customers. Now work with your team to explore the possibilities. How does your team use event data? Share your thoughts below!